HG's Super-Duper Cocoa-rific Coffee Malt! Put all dry ingredients in 16 oz. glass. Dissolve in 2 oz. hot water. Add 5 oz. of cold water and a LOT of crushed ice (or cubes). Top off with soy milk and Coffee-mate. AWESOME! 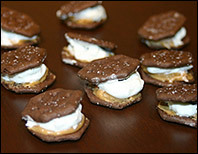 Assemble mini sandwiches by putting a tiny amount of peanut butter, some Cool Whip and a single chocolate chip in between two Oreo thin crisps. Place on wax paper and freeze. Enjoy! 3 Points? It MUST Be a Dream! Break up VitaTops into small pieces. 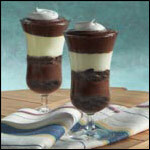 In juice glasses or parfait cups start to layer, like this: chocolate cake, chocolate pudding, cake, vanilla pudding, cake. Top off with FF Reddi-Wip. Makes 2 parfaits. Today, April 13th, is National Peach Cobbler Day. Celebrate carefully...with some Steel's Peach Pie Filling and fat free whipped cream! Share these head-exploding, too-good-to-be-true, chocolicious recipes with every human you know. Click "send to a friend" NOW!